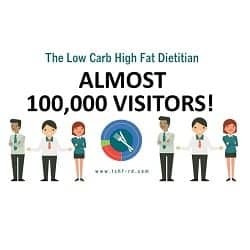 The LCHF-Dietitian website is preparing to celebrate a significant milestone; our 100,000th visitor in just over a year! While I’ve been providing low-carb services to my clients for slightly over 4 years, the first three were through BetterByDesign Nutrition Ltd., my private practice located in British Columbia, Canada. It was when I began writing a blog about my own “n=1 experience” following a low-carb lifestyle (called “A Dietitian’s Journey”) that visits to the website took off; jumping from a couple of hundred people per day to 600-800 daily. 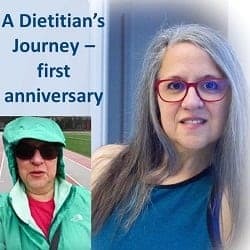 So as not to overwhelm those coming to BBDNutrition’s website seeking support for food allergies and sensitivities, Irritable Bowel Syndrome (IBS) and healthy eating with articles dedicated to low carb, I decided to create a separate website, The LCHF Dietitian and there’s been no looking back. 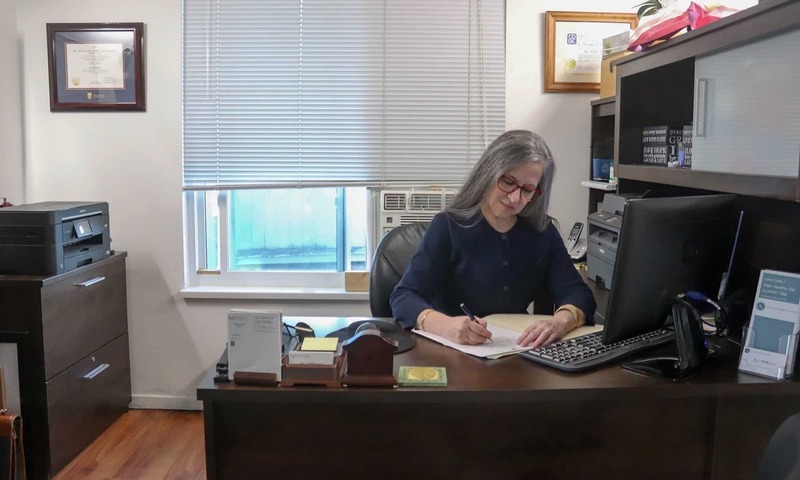 Interest in “A Dietitian’s Journey” continued as I began to reverse my decade-long Type 2 Diabetes, lower my blood pressure and get lab work that showed my triglycerides and cholesterol becoming not only normal, but ideal. There was considerable interest in the “Science Made Simple” articles I was writing, where I explain the evidence-base for the use of a low carb or therapeutic ketogenic diet, complete with references. I joined Twitter (@lchfRD) as a place to post a link to newly written articles but it was when I began to post pictures of food I prepared for myself and my family, that people began asking me for my recipes and it was at that point, the Food for Thought (blog) tab on my web page added a third section; Recipes. At present ~1200 people are following me on Twitter and it grows daily, depending what I post about. 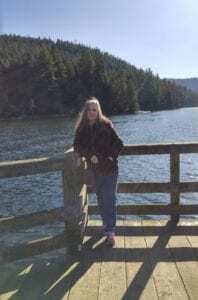 Some folks are very interested in the researched articles I write, others in the recipes and still others want to know about my continued weight loss or latest lab work, as posted in A Dietitian’s Journey. Around the same time I joined Twitter, I created The LCHF-Dietitian Facebook page as another place to post links to new articles and much to my surprise, I now have ~430 people ‘like’ me there and 493 ‘follow’ me, with 40-60 new people per week “liking” the site. I really don’t think I am that interesting! I believe it’s the content on the site; the topics that I write about that brings people to my site initially. There is a huge interest in the LCHF lifestyle as a whole, and in the use of a therapeutic ketogenic diet. People are looking for credible information. I believe that I provide that. I think once people have read through some of my content, they feel comfortable approaching me to provide them with services; because they trust that they are going to get a Meal Plan designed specifically for them – for their needs, their food likes and dislikes and lifestyle, and designed to help them achieve their personal health goals. I also think that me being a formerly obese Dietitian that has reversed my own Type 2 Diabetes*, high blood pressure, high triglycerides and cholesterol encourages people. Everyone is different, and they know because I repeat it often that their ‘journey’ will be different than mine, but in posting mine folks know that I understand the issues personally, as well as from a clinical perspective. I’ve been fat! I’ve been metabolically unwell! Yes, I do understand. HUGE PERSONAL MILESTONE: It’s not only my HbA1C that is in the non-Diabetic range (<6.4 mmol/L / 115 mg/dl) but my fasting blood sugar is finally in the normal range too (averaging 5.3 mmol/L / 95 mg/dl over the course of the past month!). This morning for the first time EVER, my fasting blood sugar was 4.9 mmol/L / 99 mg/dl!! Currently, there is a great deal of interest in all things “low carb”, so much so that in the last few months I’ve need to begin posting some of the articles that I wrote for The LCHF Dietitian web site on my regular web site, because I’ve had so many people contacting me there, asking whether I can help them follow a low carb or ketogenic diet. So, it’s come full circle. I have always believed that nutrition is “better by design” which is how I came up with the name for my private practice, and the web site that represents it. I also firmly believe that a low carb diet needs to be designed. Some young adults with no clinical conditions and not taking any medication may do very well following a generic “low carb diet” online, but for adults and older adults with Type 2 Diabetes, hypertension, high cholesterol or triglycerides and especially taking medications, following a low carb diet they found on the web can put them at significant risk. If you fall into this category, please read this article. A low-carb diet is BetterByDesign. Do you have questions about how I can help support your own ‘journey’ back to health? Please send me a note using the Contact Me form above and I will reply as soon as I am able. To yours and my good health! Last March 5th I wasn’t feeling very well. It had been ages since I had monitored any of the things that I was supposed to be keeping an eye on. I had Type 2 Diabetes (T2D) for ~10 years but hadn’t checked my blood glucose in close to 2 years. I had high blood pressure, which is common for those with T2D and even though I had a quality blood pressure monitor, I hadn’t used it in about as long as I hadn’t monitored my blood sugar. Needless to say, I also had not gone to have my glycated hemoglobin (HbA1C) checked in the same length of time which would have told me my average blood sugar the previous 3-4 months because I didn’t want to know the results. I was in classic denial and facts would interfere with my ability to keep ignoring it all. Denial is simply not thinking about something you know exists. The problem doesn’t go away – only your conscious awareness of it does. You just don’t think about it. This time last year I felt unwell and went and took my blood pressure. The reading was so high it was incomprehensible. I waited and rested for 10 minutes and took it again, however it was not much better. It was so high that if I gone to see my doctor that day, he would have had me go to the hospital immediately, perhaps even by ambulance. Looking back, the responsible thing would have been for me to go to my doctor or to the hospital and ALSO changed my lifestyle but I knew what that would lead to; at least one or two medications for high blood pressure and they would have run blood tests at the hospital and then would have likely put me on at least one medication for Diabetes and on statins to lower my cholesterol, too and I didn’t want to do that (more denial). Two years earlier I already had blood sugar that was too high, cholesterol and triglycerides that were imbalanced and had blood pressure that was higher than it should be and was told by my endocrinologist that if I didn’t follow through with my plan of following the low carb diet that I had started at that point, that I would “be on insulin in 5 years, along with medication for high blood pressure and cholesterol“. 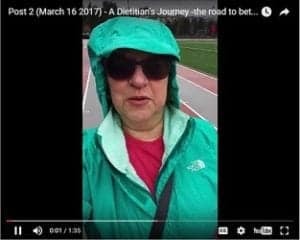 While I had started with all the good intentions of continuing to follow a low carb lifestyle, I didn’t follow through and my health wasn’t going to get better on its own and I wasn’t living in such a way as to improve it. I was teaching others about the benefits of eating a low carb diet and helping them lose weight and lower their blood sugar and blood pressure and cholesterol but not actually doing it, myself. My diet was well within the criteria of what Diabetes Canada says those with Type 2 Diabetes should eat; lots of whole grain, low glycemic index foods and since my meals were often below the 60 g of carbs at each of 3 meals and 45 g of carbs at snacks they recommended, I pushed the words of my endocrinologist into my sub-conscious and carried on. I cooked and ate all home-prepared foods, but avoiding the carbs inherent in a whole-food Mediterranean diet just seemed too difficult. I couldn’t get my head around eating shinglish cheese or hummus without whole wheat pita, or lamb brochettes without the bed of basmati rice underneath. Even though I was serving these foods with beautiful low carb vegetables they didn’t offset the constant flow of carbs every few hours. I also lived with a secret sense of futility – that achieving a normal body weight when I was obese was simply unattainable. Why even try? In October 2015, one of my girlfriends I had known since high school and who worked in healthcare dropped dead of a massive heart attack while alone at home. A few months later another girlfriend that I’d known since my early 20’s died suddenly from what I believe was a stroke – the Monday after the Friday she retired from 30 years as a Public Health nurse. My two girlfriends being in healthcare did not protect them from the ravages of chronic health conditions and cardiovascular disease, and last March 5th I realized that being a Dietitian with a post graduate degree wasn’t going to protect me either. I actually had to change. That day I decided to do whatever it took to get well and live optimally and every day since then I’ve recommitted myself to that very same decision. 1/2 inch off my thighs. While I’m still overweight and have approximately another 20 pounds to lose to reach a healthy waist circumference, I am not as desperately unhealthy as I was this time last year. I am alive, much healthier and committed to continuing this journey. The last year’s journey was not a straight-forward path as one might think given I’ve taught a low carb lifestyle to my clients for the past 3 years, as it took a bit of time to figure out which type of low carb diet my body responded to best. Everybody’s a bit different. I started out with a low carb high fat approach and a few months ago switched to a low carb higher protein approach, along the lines of what Phinney and Volek use with great results (more info on the type of low carb approaches here). As I planned to do when I reached this level of health, this past week I began introducing exercise into the equation, but not what I did before (what people called “cardio”). My focus is on building muscle tissue using slow high intensity exercise (slow HIT), following the protocol of Dr. Doug McGaff. This will have the benefit of improving my insulin sensitivity, and along with eating sufficient protein distributed through the day should enable me to continue to live an active lifestyle, as I age. Last year I was given a ‘second chance’ and I am taking it! 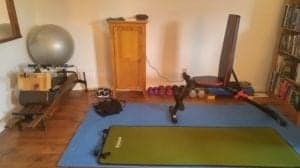 To celebrate my one year anniversary, as a ‘present’ to myself, I bought a weight bench to use with my free weights and resistance bands, and have set it up in a corner of my room. I’ve folded up the Nordic Track for now, but can open it up to use it should I want to later. I may resume morning walks now that the sun rises earlier, mostly as a way to reduce the muscle stiffness and start the day well – but building muscle mass is, by necessity, a priority. My journey has never been about “looking good” but about being healthy and living optimally. While looking better is a wonderful side-benefit, it is just that – a bonus. As a Dietitian, I’ve always believed that if people “go on” a diet because they want to lose weight and look better, they will eventually “go off” a diet because there simply isn’t enough internal motivation to continue. It is way too easy to buy the tempting food that is readily available all around us – all the more when our insulin levels are high and we’re always hungry. To change long-term requires the motivation to change. As one of my sons says “dying is bad” and since living, and living well was my motivation for changing my lifestyle, it continues to serve as my motivation every day since. (2) to face the reality that if I didn’t significantly change my lifestyle I would probably die from one of the chronic health conditions I already had, would get, or from one of the many metabolic results of having these conditions. I made my choice a year ago and I don’t regret it for a minute! Are you at a fork in the road – having to choose between continuing to do the same things that haven’t worked previously or like me, ignoring it all and doing nothing? Perhaps you’ve been told by your doctor or specialists where making such a choice may lead and you ‘don’t want to go there’, but are overwhelmed thinking of making this kind of change on your own. I can help. I provide personalized low carb and keto services both in-person in my office and by Distance Consultation (telephone, internet). I have both the clinical knowledge and the personal experience that a low carb lifestyle is not only entirely ‘doable’, but is entirely delightful. There are those that maintain it’s not sustainable long term, however I know many people that have been eating this way for 15 or 20 years and so that simply isn’t true. UPDATE: This new post titled “Low Carb or Keto – what can you eat?” shows pictures of some of the meals that I eat (following a low carb higher protein approach) and also posts links to recipes. You’ll see that it is way more diverse than slabs of meat and piles of bacon and eggs! I like to compare my decision to pursue a low carb lifestyle to someone that gets diagnosed with a serious food allergy such as Celiac disease. They need to avoid gluten containing foods to live without damaging their bodies and I need to avoid carb containing foods for the same reason. 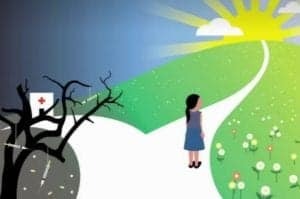 Few people diagnosed with Celiac disease will walk around their whole lives complaining about how “unsustainable” it is because for them, living itself or living in good health requires them to make this adaptation, and so they do. For me and for many of my clients, choosing to follow a low carb lifestyle enables us to put chronic health conditions into remission, so we make a similar type of adaptation. Wonder how I might be able to help you? Please send me a note using the “Contact Me” form above and I will reply soon.